MTAA needs to get professional. To that end, we made some business cards. These just aren’t any business cards however. They’re a limited edition print — signed and numbered on the back. 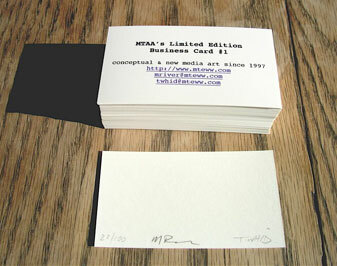 How can you get a free limited edition business card print from MTAA? You must meet us in person and give us some reason to think that you can help us professionally. There’s been discussion on Rhizome about whether or not Rhizome is covering net art well enough. This discussion led into a debate on the robustness of net art. Amongst this discussion, there has been several assertions made that the dot.com bust poured cold water on the movement but I wanted to look at it a little more closely. 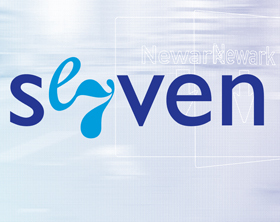 As some of you know, M.River and I were very much involved with the net art movement from 97 onward. I was also working within the dot.com bubble at the time and was very attuned to its movements. I was out of work in early/mid 00 and it was super-easy to get a dot.com gig at the time due to the fact that the forward momentum of companies isn’t as easily stopped as the rise of their stock price. Remembering the crash, I was thinking at the time that it would throw cold water on the net art movement and thinking that it didn’t seem to be happening. Probably due to the fact that museums and art institutions are even slower-moving than businesses, it took a good year or two after the dot.com burst for the net art fad to fizzle in the art institutions. Not to say that the dot.com collapse didn’t help cause it, but it took a while for it to be felt. But! The Warriors! AT CONEY ISLAND! A Digg-like site similar to MacUpdate or VersionTracker; find the software you need. MTAA: why is it ‘liberated’? Executes a code block by evaluating an entity according to its current value as well as all previous values. Designates an abnormal flow of program execution and guarantees that it will never be handled as an error. A branching construct that moves flow control from the current instruction to a stray position in the program. Allows for possible, but not guaranteed, execution of code blocks. Guarantees that a block of code will never be executed. This is similar to block quotes in other languages, except that “never” blocks are not removed during compilation. Evaluates an entity only according to as yet unrealized possibility. Because the Awards program was originally conceived as an official project of the White House Millennium Council, the First Lady serves as the honorary chair of the gala at which the winners are celebrated. She also traditionally hosts a breakfast at the White House to which all the nominees and winners are invited. That breakfast was today. This year, however, five Communication Design honorees decided to decline the invitation. They wrote a letter to Laura Bush explaining why. Well, that’s not the actual title of the actual series… or perhaps there is no series? It seems to be more of a pattern. Eh.. what am I babbling about? Oh yeah! Our new piece (that M.River conceived, and today, built at Aljira in Newark as our submission for E7: Aljira Emerge 7 Exhibition (more here)) is pictured below. We’ve done this sort of thing in the past when invited into galleries. (Silly gallerists, don’t you know you shouldn’t invite filthy net artists into your pristine white walls?). For the Pirated Movie, MTAA took the bootleg and projected it in black and white without sound at Postmasters. We had a group of artist perform a live soundtrack for the film. This one time only performance was recorded and mixed with sections of the bootleg to create a final DVD. This year, I’d like to mess with the recipe a bit. I’m still thinking about projecting the bootleg silent in black and white but I’d like to try it outdoors without the bands. Just set up some chairs on a sidewalk or in a park and press play. The final DVD will document the results. James Wagner’s post on Chris Moukarbel took me back to the thought that fueled dc911. If you take our pain for propaganda (and/or profit), we will take your film for art. opening reception: Thursday, July 20, 5:30-8:30PM at Aljira in Newark, NJ. This is a big group show of a bunch of artists (see link above for a full list of artists) that have taken part in Aljira’s Emerge professional development program.